Greenwich park (London) has around 30 mature chestnut trees. OCtoberis the time to be collecting your sweet chestnuts. As the October winds get going, there will plenty more of them to collect from under the trees. Don’t confuse them with horse chestnuts (conkers), which are inedible. You can see pictures of the sweet chestnut tree in the Woodlands.co.uk Tree Identification Guide.The hedgehog-like cases are covered in long, pliable, green spikes. Split open, they contain 2-3 shiny, roughly triangular nuts with a distinctive tuft on the end. 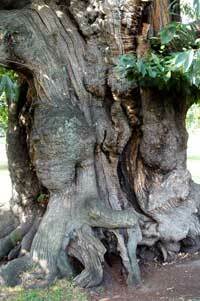 Although the European sweet chestnut originated in Greece, and is therefore not strictly speaking native to this country, references to the nuts as a foodstuff are found from ancient times.The Romans planted trees across the empire, explaining why “castan” (the Latin word) appears in various versions throughout Europe, for instance “castanwydden” in Welsh, “kistin” in Breton, “châtaigne” in French and “chestnut” in English. Chestnuts are not like other nuts. They have a mealy, floury texture and are mostly carbohydrate, unlike most nuts, which are protein-rich. Where land was not suitable for cultivating grain crops because it was mountainous and/or forested, the nuts were a valuable food source and were ground into flour. Chestnut flour is still used in rural French and Italian cooking to this day. It is also worth noting that chestnut flour has no gluten and is therefore suitable for a gluten-free diet. Assuming you’re too hungry to go to the trouble of milling your nuts into flour, what do you do with them? The sweet chestnut tree is very high in tannins and some people say the nuts are too bitter to eat raw. I’ve nibbled on a few straight from the shell and haven’t found this so, although perhaps a bit indigestible if you ate more than a couple in one go I think. Cooked, they taste slightly nutty and fairly bland, but they work well as bulk and go with lots of other flavours. Preparing chestnuts is not difficult, but a bit laborious, so get comfortable and enlist some help and company. Put the nuts in a big bowl and pour boiling water over them. Leave them for a couple of minutes to let the skins soften. Then scoop some out into a second bowl of cold water to cool them enough for you to be able to handle them. Peel these, and carry on in this manner until you’ve worked your way through the bowlful. Once peeled they can be made into warming soup, cooked with sprouts and bacon, added to stews or stuffings, or soaked in syrup for traditional marrons glacés. Alternatively, and best of all, you could slit the skins with a knife (they explode otherwise) and roast them. A good reason to get the barbie out for a last airing. Soften the chopped onion in a knob of butter or a tablespoon of oil. Add the chestnuts and stock and bring up to the boil. Simmer until the chestnuts have collapsed. Season to taste, and add some crumbled bacon and chopped herbs.